WHEN you watch the petite Paritos Kar pin his six-foot-tall opponent down to his knees by simply standing his ground and blocking a punch by a turn of his wrist, it is evident that size does not matter in the world of martial arts. Kar is a fourth-degree black belt in Aikido, a Japanese martial art form which does not rely on speed and power to gain the upper hand in a confrontation. “This form relies on grace and fluid body movements, together with the ability to control one’s thoughts,” explains sensei Kar, who has been running his dojo (classroom) at the Arya Samaj Mandir premises in Greater Kailash, Part II, for the past 10 months. «In this technique, we primarily teach self-defence, not attack. Attack is only used once all other methods have failed,» says Kar, helping his opponent up. It is evening, and Kar is surrounded by about 25 students in traditional uniforms — a white cotton top and pleated black skirt called the hakama. The class is about to commence. Before the routine kicks in, the students pay tribute to the founder of Aikido, Osensei Morehei Ueshiba, by bowing in respect in front of his black-and-white portrait on the wall. Ueshiba was a 20th Century Japanese martial arts practitioner who believed in a peaceful and non-confrontational technique against an adversary. “AI” stands for harmony, “KI” is the universal energy and “DO” translates into the way. For Kar, it all began 24 years ago, when he went to Tokyo as a visiting tourist after graduating from university in West Bengal. Smitten by Aikido, he stayed on for 15 years and mastered, apart from Aikido, the Japanese language. Kar has been teaching the martial art form for five years in Delhi after a brief stint in Russia. Kar says there are no age restrictions in Aikido, since it is not physically demanding. “Yet, it is a great way of keeping fit. A one-hour routine can burn 300 calories,” he adds. 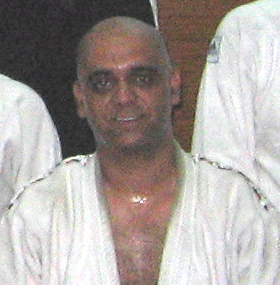 With only a handful of Aikido practitioners in India, the exclusivity of this technique can be gauged by that fact that there are no competitions held here*. An attact can happen to anyone, at any age, in any place. There are some tips on what you can do in such a situation. It is best to avoid isolated, dark places. Avoid dressing provocatively – you are inviting trouble. In a potentially dangerous place increase your level of alertness. Be aware of who is walking in front of you and behind you. Mentally be prepared for any eventuality. If someone makes suggestive remarks to you, be calm, firm, do not insult or inflame the potential aggressor. Show no fear. Immediately head or run towards a safer place. Even if you are trained in martial arts, Running away is still the most sensible option. Attacks frequently happen from behind, unexpectedly. If you have your dog with you but he is non-aggressive (not likely to attack human beings), immediately take him on the leash and keep close to yourself. Any threat to you will be interpreted by your dog as a threat to him. His aggressive pose, growling or barking is likely to scare off the aggressor. If you have been attacked, do not be shy to shout for help. Yell as loudly as possible, even if there is no one around. Do not feel inhibited if your clothes are torn during the fight. When the situation is over, you will receive all necessary help from people/police. Ordinary objects like sticks, rocks, a handbag, an umbrella, keys or a pen can be used. Shoe heals are powerful weapons. Do no hesitate to inflict pain to the aggressor – your life is in danger. Temples, eyes, throat, septum of the nose, solar plexus area, groin, knee caps, shin bone, instep (for a heal attack), armpits. Calculate: what is really happening? what is the worst thing that can happen? what are the possible options? what is the best option for you NOW? Then act accordingly and decisively. An aggressor may threaten to use a knife on you. Access whether the knife threat is real or not. Access whether the attacker is alone or his buddies are nearby. Put up a resistance. Look for a weakness in your attacker. Look for an opening. Pre-empty. Never mentally assume that your attacker is more powerful than you. Continue resistance. Make yourself a hard target. Your endurance for a length of time may wear out your aggressor. During a fight, both the sides are in an altered psychological state: their powers are increased manifold, they feel no pain. In such a situation, a person who maintains the presence of mind, who is not overcome with emotion wins. Remember, people under the influence of narcotic drugs, FEEL NO PAIN. Physical injuries will not deter them. In comes as the last point, but this is the first thing I personally advise you to do. An Aikido response is opposite to what many of us are conditioned to do when facing a difficult situation. The society-conditioned reaction of an average person is to resist or to deny the situation. An aikidoist’ momentary approach would be: “This is the situation. How can I use it to my advantage?” In fact, the whole Aikido training is about ingraining this approach on the level of your intuition. In aikido you learn to go with the flow, accepting the aggressiveness of your partner and redirecting his own force creatively in order to neutralize him without harming. “This is the situation. What is the lesson to learn here? How can I use it to my advantage?” – when you apply the same approach in life, your life stops being “hard” or “depressing”. Life becomes interesting, you start evolving. 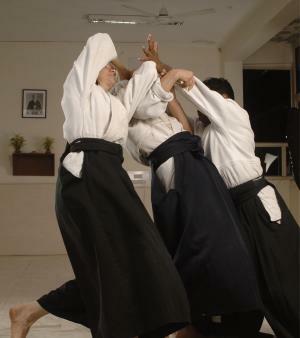 Aikido is a unique martial art because it’s not about fighting. There are no opponents – only partners. There is no aggressive sparring – you cooperate with your partner. There are even no competitions and medals – your victory is the victory over your “smaller” self. Aikido is not even about defending yourself. When you feel no anger – you have no enemy to fight against. When you have no guilt, you have nothing to defend. When you have no emotional reaction to a life situation, you have the power to solve it constructively. Your shield is your righteousness: when you do the right thing, you harmonize yourself with the Universe. When you are ONE with the Universe, it will automatically protect you through the Law of Karma. There are many debates in the Aikido world about the existence of mysterious Кi. Whether you believe in it or not, does not matter. People-who-know work with and use Ki in their Aikido practice. There are many levels of Aikido training. In the beginning, it’s all about techniques and body mechanics. On the higher levels, it’s about energy. And that is why learning Aikido takes a lifetime. You do not learn Aikido, you mature into it. On the surface, in your training you keep repeating the same basic techniques over and over again; but the act of constant polishing slowly opens a new dimension – the dimension of energy, even to a rationalist. 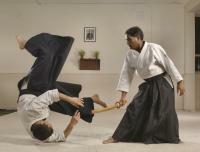 You can get a glimpse of “Aikido magic” while training with a Master. And from that moment on you are hooked for life because you will ever seek to learn THAT-what-you-cannot-put-in-words. We are multi-dimensional beings, not only physical. However, very few people know what are the implications and practical applications of this fact. When you become aware of the energy aspect of your being and when you learn how to utilize it positively and constructively, you will be able to enhance all aspects of your life – your physical, financial, relationship and spiritual wellbeing. I don’t like going to the gym. I have tried and tried hard. In the years during my under-graduate studies, MA training was not available where I studied. So I tried to do running, gym, games like soccer, basketball etc. I did something or the other throughout. But I did not diligently train any particular thing. That is I burned calories, in many different ways, but there was very little skill acquired for all the work I put in. There just wasn’t enough motivation to continue training beyond a few weeks when the initial tempo gave out and sustained motivation was required to train diligently. Surprisingly I could not pin point the exact reason why I did not feel motivated. I like being fit. I don’t mind physical hardwork and pain. And I love the feel when after long practice , things I was clumsy and ungainly with initially, I execute with economy and beauty. One exception to this was martial arts. I have practiced karate and jeet kune do at different times. As long as I was practicing in the dojo, nothing was too hard, over strenuous or boring. Even on days when the practice involved huge number of repetitions, arms and legs felt like lead but inside I was raring to go for the next class. This feeling was even more pronounced when I started Aikido with Sensei Kar in March 2007. Even with twisted elbows and knees, pain in the back from so many botched ukemies, the desire to go to the next class was always as strong. • I have lost 14 kgs in 10 months, without dieting! What else do you want? But they say, you can get the same benefit by going to a gym, yoga, jogging or any combination of these, and so safe and soft on the body. But now I think I see the difference. The difference lies in my objective. If my objective was to get fit and nice looking body and no more, then he gym approach is good. But that alone did not satisfy me so very soon I get bored with only the physical exercise. My satisfaction seemed to relate to the control and awareness over my body that results from taking ukemi, the loss of fear. The ever increasing capacity to adapt my body in response to the stress put on it. Learning to take ukemi I think is the key to the heart of Aikido. To adapt to the force and its direction as applied by the Nage, to go along with its application and finding your balance again without loosing the combat initiative. The sense of relaxation was, I think, a result of reduced anxiety. Anxiety and fear for getting hurt, over uncertainty about a situation, physical or otherwise. It is this loss of fear and the accompanying confidence in my capacity to control my body to ever changing physical and social environment, that makes me feel relaxed and aware at the same time. ‘Relaxed and aware’, I think yogis call this state the ‘witness state’ where one is able to look at one’s circumstance without being emotionally effected by it. To be able to maintain it permanently, for it to become part one’s nature, is the elusive goal for most of us, even though many may not be aware of it. Martial artists have spent thou­sands of years discovering special skills that enable them to respond to life’s challenges quickly and with maximum efficiency. Aikido, which in Japanese means “the way of uniting Ki spirit,” is an art that does just that, and my own Aikido practice has given me much practical counsel. Some of my most vivid lessons were from the first day I participated in randori--an exercise where, instead of defending against just one part­ner, several people attack at once. Busi­ness complexity often arises from a sim­ilar spirited interaction of many players with independent motives. 1. Keep your center: In Aikido, your cen­ter (or hara) is a physical place where en­ergy and balance originate. It’s also a state of mind. Staying calm, one avoids over-confidence, anger, and fear — those de­stroyers of intelligence. Keeping your cen­ter means you will always act from the po­sition of your greatest power. 2. Start in a logical place: Complex situa­tions, like randori, throw lots of things at you simultaneously. Like many people, my natural instinct was to react first to the nearest danger. I call this the LIFO (last-in, first-out) reaction to complexity. LIFO people react to stress by abandon­ing important objectives for whatever threat lands in their lap next. However, this reaction allows opponents to dictate the situation. In randori, a LIFO reaction gets you blown hither and yon, frustrat­ing you and accomplishing little. Randori taught me to start proactively in a thought­ful place — at one end, regardless of the onslaught’s source. In complex situations, picking a logical entry point for action (The highest priority? The task with the longest lead time? The player with the most influence?) puts you in control. 3. Keep moving: A mass of attackers comes at you from all sides. Your gut screams, What are you doing walking into that swarm? But your gut is wrong. One of my early senseis, who mashed up Aikido technique with a little street fighting, said, “When you’re in a knife fight, you are go­ing to get cut. Your objective is not to die.” I learned from Aikido that you can’t suc­ceed if you fear moving forward. In com­plex business situations, inexperienced people tend to freeze up, and a common reaction is completing only the minimal requirements in hopes that the situation will resolve itself. Randoriwisdom teaches that even when things are extremely uncertain, you must act, proactively seek­ing a better position of power. I found this positioning task the great­est randori challenge, because it requires an extraordinary degree of anticipation. You have to sense where your opponents will go next. Aikido trained me to antici­pate by extending my attention beyond the action in my face to see the larger situa­tion. Everyone can do this — otherwise we’d be watching the windshield wipers instead of the road. In business, this is an infor­mation task. Expanding your horizons with diverse experiences and data from a wide range of sources helps you envision a more accurate future. This dynamic vi­sion gives you a place to anchor information as the wolves circle. You can priori­tize actions and make better choices.